Cute Jewellery by Chelsea Doll: Purple Rain - New Range! We're just a little bit in love with purple at the moment. Actually, words cannot describe how much we adore the colour, we're totally smitten!! So, due to our over-excitement at having lots of purple in our jewellery, we've put together a new range called Purple Rain (great name, eh?). This will make getting that hint of purple in your lives soooo much easier! 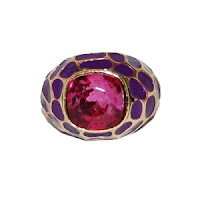 Our fave from Purple Rain, hmmm that's a toughie, it's got to be the Purple Tortoise Shell Ring, a-mazing!